I'm a professional photographer who enjoys costuming with the UK Garrison and Reel Icons, and happen to take a few pictures along the way. I have also recently completed a Star Wars Astromech droid (R2-D2 style) R2-TK. I also happen to run my own (non-photography) business. After taking a few pictures of a canoeing event, I started working for local news (Windsor & Slough Express), and then moved up the ladder working for a London based Press Agency and Freelancing. I covered a wide range of news related subjects from the standard cheque presentation 'grip and grin' right up to overseas Royal Tours with Princess Diana, Prince Charles and other Royals. I also had a trip to Bosnia with an aid convoy and well as an amount of commercial work. I trained on film, could drive a darkroom (even in a hotel bathroom at 3am) and learnt to work to tight deadlines. 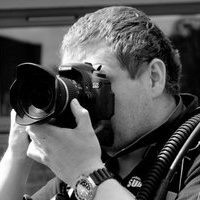 My pictures have been published in national and international publications from the tabloids to People Magazine in the US, Das Neue in Germany and Hello Magazine in the UK, I have also worked commercially for such diverse clients as Pets at Home and British Gas. 2017 saw me join the UK Garrison staring with building a classic Stormtrooper costume, quickly followed by a Scout trooper, both cleared to 501st standards and Judge Dredd(2012) cleared with the Reel Icons. I am lucky in so much that my brief insight into the experience of costume building together with my experience as a photographer allows me to combine the two and produce images that seem to go down well with costumers and the public alike. I am now part of the UK Garrison PR team, taking pictures of UKG costumers at the various events we attend around the UK. I aim for quality rather than quantity, and try to bring my professional eye to a very crowded environment, at least when it comes to costume photographers. I now regularly work with major costuming groups and organisations such as the UK Garrison, Reel icons, Rebel Command and Silver Sabres at major events including MCM ComicCon, Showmasters and others around the UK producing a range of images suitable for costumers and general event promotion. All of my images are available for use subject to agreement, but if you need something specific, or you have an event running that you feel would be of interest, then please drop me an email. All my images are copyrighted. That means you cannot use them without my permission. They are NOT public domain images. However I am quite happy for you to use and share my pictures over social media and non-commercial websites as long as they are not mis-represented, and you credit me as the photographer. I am also now able to offer a printing service, so if you would like (high quality prints upto A3) of any of my images, then please contact me. If you wish to use any of my images for any other purpose, either professional or commercial then please contact me before you do so - copyright law in the UK is quite clear and easy to enforce for illegal use of images.